Ahead of us the Trans-Flores Highway stretches for 666 km. The fact that Flores itself is only 375km long is an indication of just how many zigzags and snaking switchbacks we will have to travel along one of the world’s most dramatic roads. The car hire company at Labuhan Bajo o‘er us a luxury 4WD but, to their amazement, we turn it down in favour of a battered old pick-up truck that we immediately christen ‘Rusty’. The pick-up has the advantages of 360º views and natural air-con. It will also function as a mobile sun-lounger. Despite the island’s sinuous shape – like a gigantic dragon snaking out of the Komodo Sea – Flores is most famous for a highland landscape that boasts no less than 14 active volcanoes (only Java and Sumatra have more). Rusty’s flatbed will allow us a perfect widescreen, panoramic viewpoint of some of the most dramatic volcanoes on The Ring of Fire. The Indonesian landscape from the vantage point of a moving vehicle is the world’s best road-trip movie, and I don’t want to miss a moment of it. Tyres skitter on loose gravel switchbacks as our driver Yovi steers us up through the coastal banana plantations. We pass pretty little kampongs, shaded by palms and papaya trees and adorned with flowers. Soon we’re entering the shade of a forest of silver-trunked rubber trees. When we stop to eat at a roadside Masakan Padang eatery I explain to Yovi that we don’t want to be restrained by a strict itinerary. We’d prefer to travel on a wing and a prayer, I tell him. We’re happy to stop to take in whatever sights along the highway he thinks will interest us. Jam karet reflects the relaxed island lifestyle and is a perfect antidote to the schedules and deadlines that are a part of modern life. For the next week ‘rubber time’ would seem to be the ideal remedy to our lack of planning, and we gratefully delegate control of our itinerary to Yovi. Ikat (literally ‘tie’ in English) weaving is a textile craft utilising naturally-dyed, hand-woven threads to form patterns and motifs. Ikat carries traditional and ceremonial significance and varies tremendously as patterns and motifs are handed down through generations within a family, creating a timeless link between ancestral and modern Indonesia. The little village of Aimerie is known for the production of homemade arak, tapped from palm trees and distilled in homemade stills. By the time we arrive, however, we can see little apart from the narrow beams of oil lamps slicing between the slats of rough-hewn timber houses. Here Yovi introduces us to his uncle Pak Haryati who promptly rustles up a meal of chicken, rice and cassava leaves, and without a moment’s hesitation invites us to stay in his family home. Over the course of the next week we will see many times how, along with rubber time, traditional old-time hospitality is a central tenet of rural life in Flores. I sleep well, and when the village cockerels provide a wake-up call, I wander out into Pak Haryati’s garden to enjoy a clear, crisp morning in which colours seem to have a rare intensity. The tangle of flowers around the old porch are almost painfully vivid and I wonder if it must have been just such a morning that inspired the first Portuguese explorers to name this area Cabo das Flores-the Cape of Flowers. Run your fingers over the fine ikat textiles that are such an important part of the ‘cultural fabric’ of Flores. 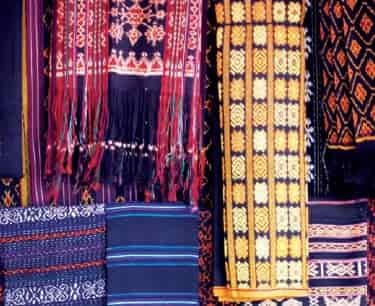 While ikat varies from island to island, some collectors claim that the intricately patterned handwoven fabrics of Flores are the world’s best. In some villages you will even get an opportunity to try your hand on one of the ancient heirloom looms. Indonesia could qualify as the most diverse country in the world, with more than 17,000 islands stretching from Aceh in the west to the unexplored valleys of Irian Jaya in the east. Flores lies almost at the centre of the Indonesian archipelago, and even this relatively diminutive island has five di‘erent ethnic groups. On the slopes of Gunung Inerie volcano we stop to visit a traditional village of the Ngada people. The thatched huts are built around a central compound that is the hallowed spot where meetings are held and rituals take place. The monsoon suddenly breaks in great cascades and we take shelter in a hut, sipping syrupy co‘ee while the Ngada women weave the fine ikat textiles for which Flores is famed. Yovi tells us that it’s best to arrive at Kelimutu at dawn but to do this we need to make it to the mountain hamlet of Moni by nightfall. The long day of driving is unforgettable. Throughout the morning we enjoy tantalising glimpses of the mighty Gunung Mej volcano against a stormy monsoon sky. We roar across vast sweeping plateaus of luminous paddy fields and rattle through steamy forests that swirl with the ghostly haze of hot springs. In the afternoon we cruise along a coastline of black volcanic beaches that are bejewelled with pearl-white stones. Feast your eyes on the sparkling gem-like lakes of Kelimutu. The three di‘erent coloured lakes (at 1,600m) were sacred to the people of this area, and it is still an impressively spiritual place. The colours of the lakes have changed over the years, and now one is green, another chocolate and the final one a piercing blue. Life is simple in Moni, but there are luxuries here that would command a high price in other areas. After a hearty meal of spicy nasi goreng at a roadside hotel, Yovi suggests that we drive up to the nearby thermal springs for a bathe. We agree to take a couple of hitchhikers from the village and word gets around: by the time we leave there are 27 people on Rusty’s flatbed. There are two huge natural pools, however (one male, and one female), so we sit and chat in the steamy water until long after sunset. By the time we’re nearing the end of our journey we’ve made many friends along the highway. We’ve passed some of the bemo minibuses several times a day and by now we recognise them by their colourful names: ‘Mama’s Boy’, ‘Terminator’, ‘Tomb Raider’, ‘Ooooh Baby!’ Their drivers beep musical horns at us and shout for photos. There can be no better way to enjoy the beauty of Flores than on a 666 km road-trip along the ‘hellish’ Trans-Flores Highway. As we say goodbye to Yovi in the spice market at the eastern port of Larantuka, I wish that I could stretch jam karet in our favour. If I could, I’d twist it around, tie it into itself and do the trip all over again.